Ballboys. Aside from looking creepy and lobbing the occasional Balloon flurry at you, not a big deal. Still a threat in large groups, however. Dogfights. No big deal. They thwomp you. Thwomp them back. These guys only get dangerous if they weaken your party enough and use Waterhose, which doesn’t happen too often. Heal to prevent Waterhose from killing anyone. Meringue. They use… Snowball? Chilly. Not a big deal as long as you’re healing occasionally. - Head north. Before you hit the next boss - he's hard to miss - you'll see a green tent, among others, that you can approach from the bottom. If you press against the tent's opening for a few seconds you'll find a hidden path to Deep-Metal Mine. Wander through this long, straightforward passage to find a red chest containing the Curse: Status Chip. You need to defeat a Mad Endo to get at the chest. - Return to Pinwheel Circus. 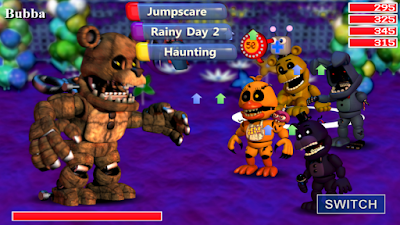 Fredbear’s waiting, and past him a bulky dude is blocking the path. Huzzah! That is one hell of an eyebrow. 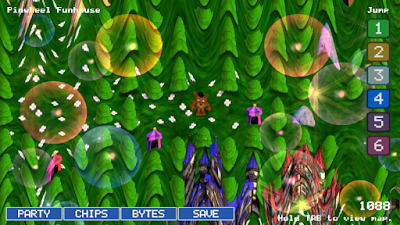 Browboy is a brutal opponent, even though he’s basically just a buffed-up version of Ballboy, and he’ll alternate between single attacks for around 250 points of damage and a Balloon strike that hits multiple targets. The normal attack is by far the greater threat, and you’ll want to be healing constantly to offset the effects. Debuffing Browboy with a specialist in the area - I like Phantom Freddy, personally - will make his damage output more manageable as well. - The Circus starts to open up a little past Browboy. Look north for a chest containing the Auto: Regen Chip, then approach the green tent on your right. 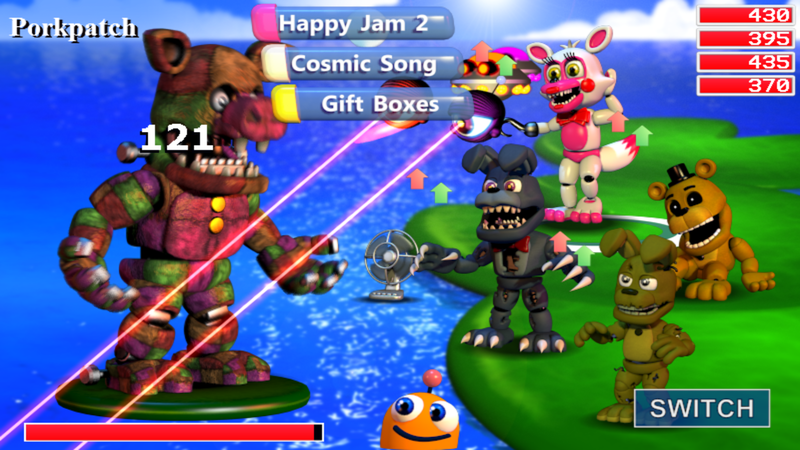 The Pinwheel Funhouse in FNaF World. Tangles. KILL QUICKLY. These jerks have, and will use, Esc Key to murder everyone you know and love. Death attacks will dispatch them in a right hurry. White Rabbits. If encountered one-at-a-time they’re kind of pathetic. You will get stunned occasionally. Groups of them are much more dangerous, however, as they can stun you into submission and rob you of turns over and over. Stunning them before they can do the same to you is effective. Redbears. (Breadbear?) Fairly strong, but they don’t have any crazy special moves to fear. They can also spam Jumpscare to stun you if you’re unlucky, but they don’t seem to use it as often as the White Rabbits. 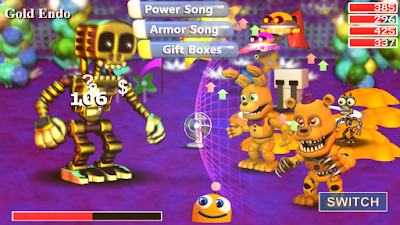 Gold Endo in FNaF World. Oooo, swag. Gold Endo is more or less the same as Mad Endo, with the addition of Hot Cheese attacks that will drain your party. Painful, but not horrible, and if you can beat a Mad Endo you can beat a Gold Endo. Heal, revive, conquer. Gold Endos are quite rare, but they drop a looooot of Tokens. Yay for wealth! Along with this lot you will find the final members of your animatronic team in here. 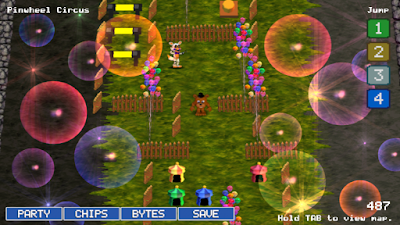 If you haven't gotten an animatronic yet, look for them in Pinwheel Funhouse with Find: Characters equipped. They'll show up eventually, and you may need the extra levels gained looking for them in coming areas. - You appear in a small, tree-filled clearing with two more tents. Both of these tents will teleport you into what appears to be Mysterious Mine, albeit a nicely-lit version of the Mine. The tents strewn throughout here will deceptive, as they lead you in a big ‘ol loop regardless of the direction you go. Take a right at the entrance, walk east, and look for a tombstone stuck in the wall below you. You can walk through the wall and touch the tombstone to jump. - You’ll appear in a clearing. The purple tent to the left leads to a loop, so ignore it, walk down two tree stumps, and walk through the stump on your right. Boss! Bubba, the beefy bear boss of Pinwheel Funhouse. Big boy! Bubba’s straightforward but very tough. He has two attacks: his normal strike, no big deal, and Jumpscare, which stuns everybody for a short while. Annoying. Bubba has a toooooon of health, and his defences are no cakewalk to penetrate, so you’ll have to debuff the hell out of him and then batter him with your strongest attacks to bring him down. Stunning him with your own Jumpscare is recommended to deaden his strikes. Not particularly difficult, but it’ll take a while. - Beyond Bubba is - yay! - another tent. You emerge near three more tents, including one hidden in a wall. Ignore all of them and walk through the right wall if you want to proceed. Fredbear’s a-waitin’ to the south. - If you'd like to make a side trip, however, you can find a little extra. Rather than ignoring the three tents mentioned previously, enter the first one to the south. You'll wind up in a small corridor to another tent that will shoot you back several rooms. Walk through the left wall just above the second tent. This leads to a red chest containing the Counter: Bite Chip. - Head back to the main path and through the wall, mentioned above, to find a subtunnel. There are two warp points to the east, and you want to use the flashing tree up the first northbound path to proceed. Once you’ve appeared in the next subtunnel, go north a short distance and walk through the wall on your right to find another subtunnel warp. The remainder of the trip through is straightforward. ENDING ALERT! When you reach the third subtunnel layer you can walk south through one of the trees in the east. The passage you find leads to a final, unescapable area, one Fredbear warned you about several times. Congratulations! Hit Esc and reload to get out of here. - We'll assume you went the normal way. You’ll emerge at Lilygear Lake, in a small enclosure you probably saw earlier but couldn’t reach. Hit the button nearby to open it up, then approach the surly-looking pig to the north. Get out of here, Porkpatch, there are no pigs at Freddy Fazbear Pizza. Defeating Porkpatch will allow you to get at a lovely golden Key. You can now use this Key to unlock several locked doors elsewhere in the game, which will, ultimately, allow you to proceed to the end of the game. Onward! We did all the steps here and got to the ending. When we reloaded, though, the button to get to Porkpatch wasn't accessible. Is there something else we need to do? I did what was said here, but I don't reload in the lake, I reload where I last saved. Help? The steps arent very clear. You need to find a subtunnel which is North of Lilygear Lake. If you can find another subtunnel from there, you're pretty much set to advance to Pinwheel Circus. AWSOME walk through but if any of you are stuck on any of the steps just read ALL of it again because if you skip paragraphs you probably won't be able to do it! There is a subtunnel within the subtunnel near the North of Lilygear Lake. It will be a flashing tree. I appreciate the guide but it's very vague and hard to follow in places. Needs a bit of fine tuning but thank you for posting it. its after brow boy in the circus. Hope that helped. On the 4th subtunnel part, instead of Esc and reload, F2 will automatically restart to the title screen. after you get the counter:bite chip and go back, I can't seem to find the subtunnel. i cannot find the subtunnel tree you speak of friend....i got lost in the rock subtiunnel and could not find my way out so i restarted, and faught browboy, and bubba again, not to much of a hassle but still a "stunning" battle. yeah yeah yeah, OH and speaking of fighting bubba, HOW DO YOU GET TO THE "RED TREE CLEARING HE SPEAKS OF"!?!?!?! I have been on Pinwheel Funhouse for quite a while. Still no Fredbear and Spring Bonnie. I'm using the Find: Characters chip. Is there any other way to unlock them? If all else fails, advance through the game with the chip activated. Eventually your desired characters will appear. I'm stuck in Pinwheel Funhouse- after I touched the tombstone in the wall I was directed to the area with three purple tents. They loop- The stumps there won't do anything if I touch them, & if I keep trying to walk in them, I continue to get ambushed. What am I doing wrong? Not sure if you already figured it out but in the bottom right corner there is 2 stumps. Just walk through those and your good. I cannot go through the walls...a little help? Please Help! Do I need to have all the animatronics to pass the funhouse??? DON'T GO TO THE 4TH LAYER!!!! 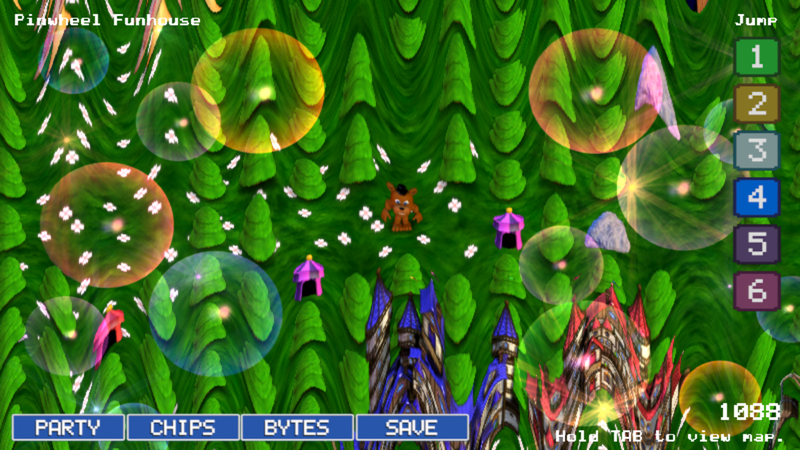 THERE IS A WARP ABOVE THE TREES THAT YOU ARE "SUPPOSED" TO WALK THROUGH. How do you get to the green tent???? 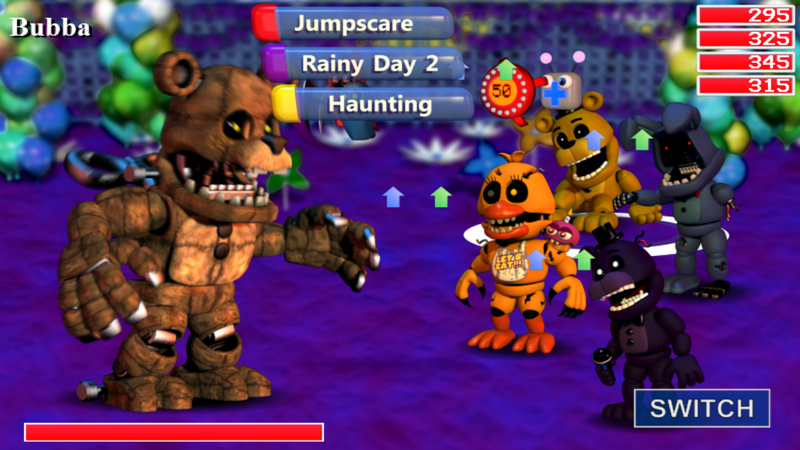 I don't know how to get to fredbear. Can someone help me? Well well well, when i enter the glitch trippy World thing, i go to the 3nd layer, then, when i go into a flashy thing, i come back to the 1st layer... Any clues? YOU NEED TO FIND A FALSE WALL MAKED OF TREES GOING DOWN, BUT GO TO THE 4TH LAYER WILL ONLY MAKES YOURSELF BE DISSAPOINTED. Warp, not war, and Pinwheel not pincherl, sorry. I used crying child for giftboxes, so IMMORTALITY!!!!! Use him if you want, too beacause I used Crying Guy and Endo 2 for defense, golden freddy and fredbear for offense. Good team! 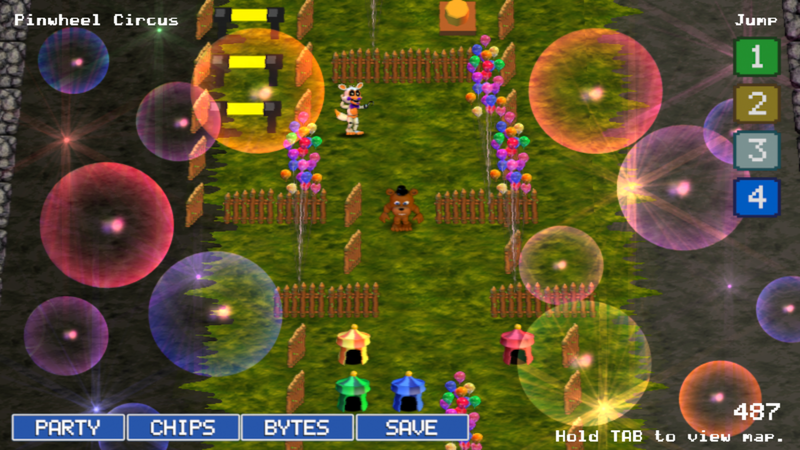 i reloaded and ended up where i met fredbear after escaping pinwheel funhouse HELP MEH!! To anyone having trouble with this one, please make sure you read it carefully. He says "Ending Alert" about the 4 layers down, meaning its an optional ending to get not something you have to do. Also you don't have to get all the characters to complete the game, it just helps. Also pinwheel circus has the highest spawn rate for new characters. And don't forget to REEEEEEAAAAAADDDDDD He says "You must fight Browboy and progress upward". The game isn't meant for one person to just hand hold you. When you get past Browboy, if you continue past him there will be a bunch of tents along the back of it. There is a green tent to the farthest right, just keep walking into it and eventually it'll teleport you into pinwheel funhouse. You will have to walk into it for a few seconds, the green tent isn't like other tents. Also, getting ambushed is just part of the game. Keep going through the stumps to the side their just walkthrough. Hope this helps.